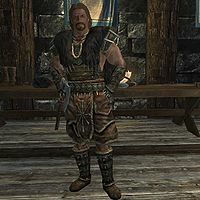 Yrsarald Thrice-Pierced is a Nord Stormcloak commander found at the Palace of the Kings in Windhelm. He is removed from the game if the Empire seizes Windhelm. Yrsarald wears a set of Stormcloak officer armor along with a matching pair of bracers and boots.